The education game market continues to grow rapidly, and mobile learning games are the dominant force in this market. Newzoo provides the insights for the generic games market; the Serious Play Conference released its annual report showcasing the huge growth specific to the education and corporate training sector. The compound annual growth rate in the U.S for corporate learning games will be over 20% between 2017 – 2022 and about 35% globally with the U.S. and India being the top two markets for serious gameplay. Newzoo predicts the overall mobile game market across all game types will grow 40% between now and 2020, a significant growth increase. So it makes sense for L&D personnel to consider what space a mobile learning game (aka one intended for play on a smartphone) might occupy in their company’s learning and development portfolio. A smartphone game is not just a shrunken version of a PC game – just as a limo is not just a bigger mode of transport than a unicycle. The user experience and design aspects one expects from a limo, and the intended use of the limo, differs widely from that of the unicycle – even though both are modes of transportation. So it is with a learning game. The use case for a smartphone game differs from that of a PC game, and the user experience should be different, too. L&D people need to think about this. When learning games go small there are four quadrants of design skills involved. It’s highly unlikely that a single individual will possess skills in all four quadrants. It’s also very likely that if you opt to go the route of a mobile learning game, you will need to pull together a team to create that learning game. Understanding each quadrant helps you assemble the right team and do a good job evaluating the game design the team evolves. 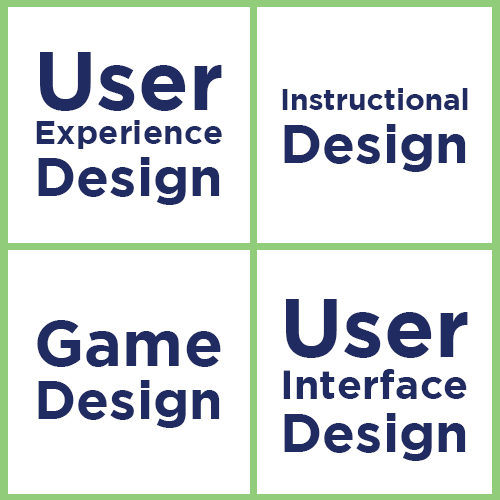 User Experience (UX) Design – the framework and navigation design of your game; this framework makes it easy to learn, easy to use, and easy to add/build onto it if you need to roll out future enhancements. User Interface (UI) Design – the graphical “look and feel” of the game; it provides the aesthetics and helps create a mood or “feel” to your game (light-hearted, scary, humorous, intense, etc.). Lots of people think UX and UI mean the same thing. They don’t. Instructional design – the design and structure of the experience to meet specific learning needs for a specific audience or audiences. Game design – the design of the play experience; it includes the core dynamics of your game, rules, and game elements that all work together to enable players to achieve a game goal and have fun doing it. Have a clear learning goal and measurable learning objectives focused on a specific learner? Manage cognitive load by eliminating irrelevant or extraneous content? Trigger emotion that can help with long-term retention of learning content? Provide spaced repetition to help with long-term retention of learning content? Use story(ies) (again, for help with long-term retention of learning content as well as involvement during learning experience)? Provide players with an intriguing goal or challenge? Match the interests or player types of your target players? Stick with one or two core dynamics? Use appropriate game elements from ones such as chance, strategy, cooperation, competition, aesthetics, theme, story, resources, rewards, levels? Make the scoring relevant, motivating, and understandable? Balance game complexity and difficulty for your player and the time you anticipate them playing it; not too easy or too little complexity, but not too hard or too much complexity either. Have touchable targets that a typical adult finger can easily succeed at using. Focus on one key action or use per screen. Make the experience seamless if intended for multiple devices. Design for how people hold/use their phone. Minimize the need to type. Attend to the small things to make a big difference. Consistent. Treat every button of the same type in the exact same fashion. Treat all screens of a single “type” the same way, etc. Use fonts and text labels for things consistently. Designed to your user – and not to your personal preferences. Example: While you may love anime art, your corporate user may find it insulting or trivial. An enhancement of the focus and not the focus of your game experience. Forgiving of user mistakes with lots of prompts and helpful guides. Clear on giving users feedback about what to do and where to go. Attend my May 2018 session at ATD ICE: When Games Go Small on Monday, May 7th. I’ll share numerous examples and you’ll have a chance to practice using the checklist. View a recording of a companion webinar to this post – When Games Go Small: Mobile Learning Game Design Do’s & Don’ts. Download a handy checklist for each quadrant of design. Check out my book, coauthored with Dr. Karl Kapp – Play to Learn: Everything You Need to Know About Designing Effective Learning Games, published by ATD Press 2017. And/or reach out to us if you have any additional questions. The Microlearning Hype: Is It All It’s Cracked Up to Be? Interested in mobile learning games? Mobile Learning Game Design Do’s & Don’ts.